There are some items that won’t fit in a neat or effective manner on traditional pallet racking. Cantilever rack storage systems are usually the best solution for storing these items. The benefit of cantilever rack storage systems is that the horizontal storage span is not broken up by traditional pallet rack uprights. This makes cantilever pallet rack ideal for objects that are too long or awkward to fit correctly on a traditional pallet rack, such as lumber and steel. Cantilever pallet racks are often utilized in warehouses, lumber yards, plumbing supply warehouses, and hardware stores. The cantilever rack storage system will be either roll formed steel or structural steel. It is a free standing system, with vertical columns that feature horizontal arms extending out from it. The product sits on the horizontal arms, in front of the vertical column. This design allows for greater horizontal storage space since the vertical column will not obstruct the product. It makes for an effective rack system for storing non-uniform type products, such as furniture, building materials, heavy-duty metals, sheet metals, bar stock, pipe, rugs, appliances, and a lot more. Many companies find that a mixture of cantilever rack storage systems and selective pallet racking will meet all of their storage needs. Cantilever pallet rack is usually placed at the end of a back-to-back row of selective rack, against a wall, or as double sided units. 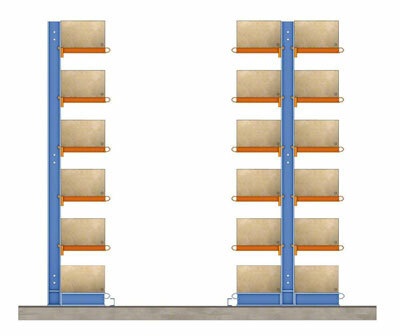 The double sided cantilever pallet racking systems have arms coming out on both sides of the column instead of just one. 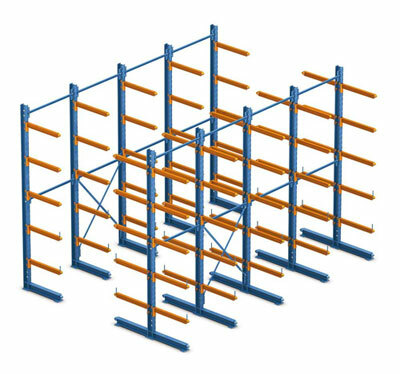 The components of cantilever racking systems are listed below. Bases: The purpose of the base is to secure the cantilever rack system to the floor, while also providing more support for the column or upright tower. The base will come in various sizes, depending on how big the arms are and the needed capacity of the rack. Columns (Uprights, Upright Towers, Verticals): The columns are the vertical pieces that are mounted to the base and to which the arms connect. The columns provide the support to the arms. Bracing (Horizontal and Diagonal): The bracing are the crossmembers that connect the columns together. These help give the whole cantilever rack system stabilization. The bracing used depends upon the stored item’s weight and size. The most important factor in determining whether a cantilever rack storage system is right for you is the size and shape of the stored items. Among other things, we will need to know the dimensions of the stored items, the weight of the stored items, how high you will be stacking the items, how long can the items span before distortion of the load occurs, and the dimensions of the area that will be utilized. Don’t worry if you don’t have all the answers to these questions. Our experts can come to your facility and help you through the entire design and installation process. Contact us today! We offer quick shipping and fast quote turnaround time. See our QuickShip items for the shipping times..
© Copyright 2018 Stein Service & Supply Company. All Rights Reserved.